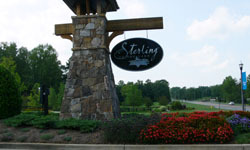 Sterling on the Lake, located 5 minutes from Lake Lanier in the City of Flowery Branch, has about 1,000 single family homes, luxury homes and townhomes. This Hall County community has a village center and will include such features as a fitness center, 27-seat movie theater, walking, biking trails, competition-size swimming pool with a 2-story waterslide & water park, boat dock and three lighted tennis courts. A new library will also be built in the community. Students attend Friendship Elementary, C.W. Davis Middle and Flowery Branch High schools in the Hall County School System. Home prices range from $220K to $1 million.